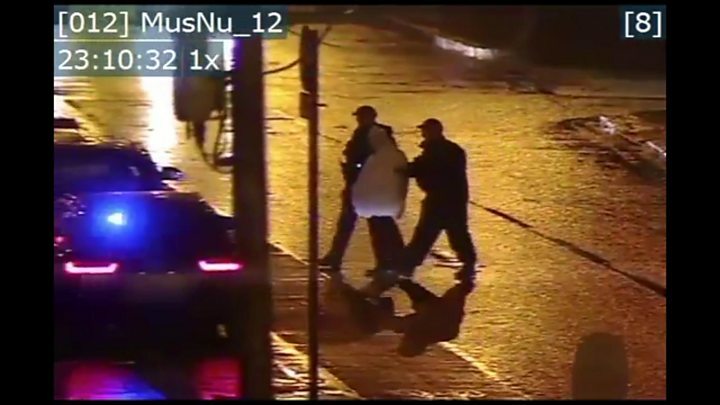 Image caption Police said Callin Wilson showed an "abhorrent lack of respect for the life of another human being"
A 20-year-old man has been told he will spend at least nine years in prison for killing a Syrian man in Belfast. Callin Wilson, of no fixed abode, was 18 when he murdered Hazem Ahmed Ghreir, 30, in the city centre in 2017. Police said they believed the "public-spirited Syrian man was trying to prevent a crime from taking place". Det Ch Insp Pete Montgomery said Wilson showed an "abhorrent lack of respect for the life of another human being". "As Hazem lay on the ground dying, Callin Wilson then rifled through his pockets and stole his mobile phone before fleeing the scene," he said. "To stab someone in the chest for no obvious reason and then steal their belongings as they lie dying in the street is something that most of us will find hard to comprehend." She said Wilson had an infatuation with knives and strangled a teacher with a wire while at school. The judge asked how Wilson could have slipped through the net, for his own safety and that of others. He was also sentenced to 12 months after admitting 20 counts of charges relating to indecent images of children. This will run concurrently as part of his prison sentence. He will spend at least nine years in jail before being considered for release. Mr Ghreir had moved to Northern Ireland and was living with his brother in Carrickfergus when he was killed. 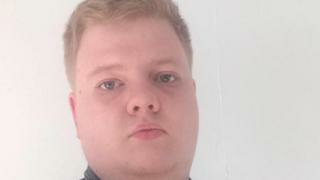 He was working as a delivery driver for a fast-food restaurant when he disturbed Wilson near Belfast's Dublin Road on 4 June 2017. Police said Wilson was arrested a short distance way in a shop, only a few minutes after he had fatally stabbed Mr Ghreir. Det Ch Insp Montgomery said: "Hazem's brave actions have tragically cost him his life. "He was originally from Syria and he moved to Northern Ireland hoping for a better life where he could feel safe. "Sadly, it was in Northern Ireland that his life was cruelly cut short by a single stab wound to the heart." Speaking after the sentencing, Mr Ghreir's brother, Rhami Ghreir, said "people were drawn to him like a magnet". "He was a good person, hard working, and when he came here he was very happy," he said. "After running from my country and that war, he thought we would have a good life here. "I lost him and I miss him every day." Rhami Ghreir said his youngest brother had been keen to make something of his life. "Before the accident happened, about 20 minutes before, he spoke with my mum and told her 'I got a job and I start working'... or any time he did something, he would call our father and tell him 'Dad, I got my driver's licence, Dad I passed the English class'."